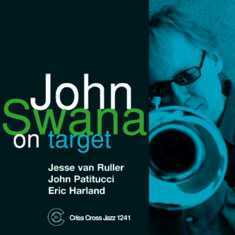 Thirteen years and seven recordings after beginning his association with Criss Cross, John Swana presents his first album as the sole front-line horn. Spurred by an ace rhythm section comprising Dutch guitar great Jesse Van Ruller, bass megastar John Patitucci, and young drum lion Eric Harland, the Philadelphia based trumpeter rises to the occasion sensationally, navigating eight original compositions with the melodic flair and technical prowess that have stamped him as a long-time Criss Cross favorite. Like the rest of Swana's recorded oeuvre, On Target testifies to his world-class talent, his ability to flourish in the company of jazz grandmasters, an elite cohort to which he clearly belongs.